A denture is a removable replacement for missing teeth and surrounding tissues. Two types of dentures are available – Full and Partial. Full dentures are used when all the teeth are missing, while partial dentures are used when there are some natural teeth remaining. There are two types of full dentures – Immediate and Conventional. Immediate are temporary dentures that are made in advance and can be positioned as soon as the teeth are removed. As a result, the wearer does not have to be without teeth during the healing period while they wait to receive their full dentures. 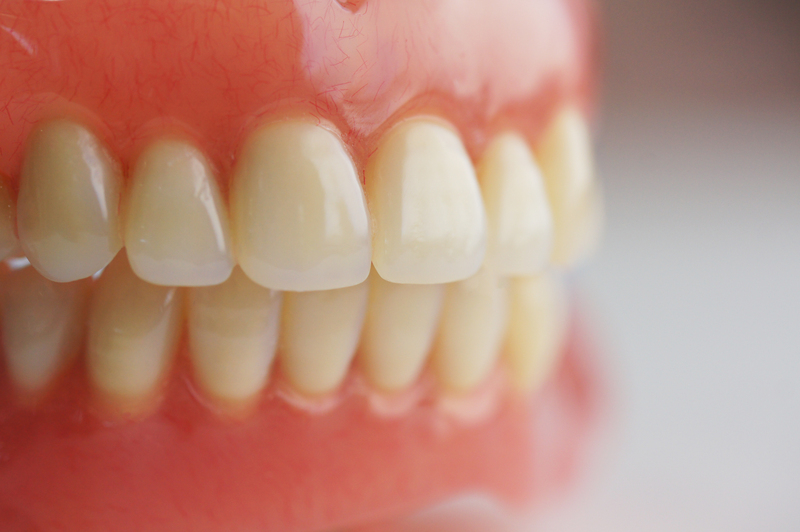 Full dentures are the long term dentures that will be worn on a regular basis by the patient. The process of fabricating a conventional denture usually begins with an initial dental impression of the maxillary and mandibular ridges. Standard impression materials are used during the process. The initial impression is used to create a simple stone model that represents the maxillary and mandibular arches of the patient’s mouth. This is not a detailed impression at this stage. Once the initial impression is taken, the stone model is used to create a ‘Custom Impression Tray’ which is used to take a second and much more detailed and accurate impression of the patient’s maxillary and mandibular ridges. Special impression material is then used for the final impression is taken of the maxillary and mandibular ridges. A wax rim is fabricated to assist in establishing the vertical dimension of occlusion. After this, a bite registration is created to marry the position of one arch to the other. Processing a denture is usually performed using a lost-wax technique whereby the form of the final denture, including the denture teeth, is invested in stone. This investment is then heated, and when it melts the wax is removed through a spruing channel. The remaining cavity is then either filled by forced injection or pouring in the uncured denture acrylic, which is cured. During the processing period, the denture goes through a process called polymerization, causing the acrylic materials to bond very tightly and taking several hours to complete. After a curing period, the stone investment is removed, the acrylic is polished, and the denture is complete. The end result is a denture that looks natural, is strong and durable. Please make an appointment with us to discuss all your options and which is the most suitable option for you!